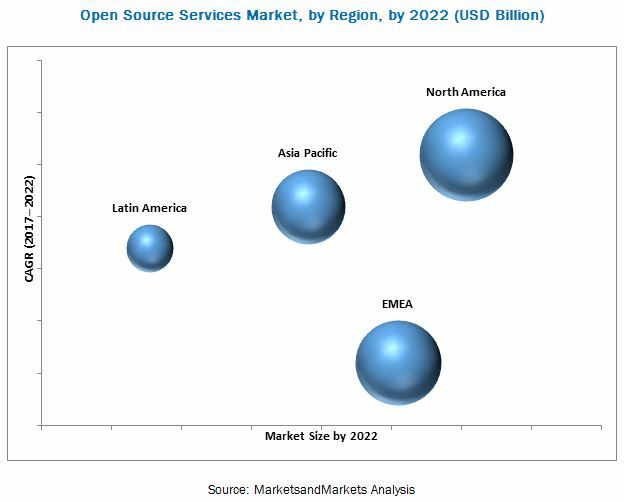 [86 Slides] The open source services market is projected to grow from USD 8.90 Billion in 2016 to USD 32.95 Billion by 2022. The global market is expected to grow at a Compound Annual Growth Rate (CAGR) of 23.65% during the forecast period (2017–2022). The forecast period has been considered from 2017 to 2022, while 2016 is considered as the base year for estimating the market study. The main objective of this report is to define, describe, and forecast the open source services market on the basis of segments including service type, vertical, and region. The report provides detailed information regarding major factors (drivers, restraints, opportunities, and industry-specific challenges) influencing the growth of the market. The report forecasts the market size with respect to 4 main geographic regions, namely, North America, Europe, Middle East, and Africa (EMEA), Asia Pacific (APAC), and Latin America. The report profiles key players and comprehensively analyzes their core competencies. It also tracks and analyzes competitive developments, such as mergers and acquisitions, new product developments, and Research and Development (R&D) activities in the market. The research methodology used to estimate and forecast the market begins with the collection and analysis of data on key vendor product offerings and business strategies from secondary sources, such as OneSource Business Browser, D&B Hoovers, 10K Wizard, Bloomberg, Thomson StreetEvents, Factiva, IT service providers, technology providers, press releases and investor presentations of companies, white papers, technology journals, certified publications, articles from recognized authors, directories, and databases. The vendor offerings have also been taken into consideration to determine the market segmentation. The bottom-up procedure was employed to arrive at the total market size of the open source services market from the revenue of the key vendors of the market. After arriving at the overall market size, the total market was split into several segments and subsegments, which were then verified through primary research by conducting extensive interviews with key people, such as Chief Executive Officers (CEOs), Vice Presidents (VPs), directors, and executives. The open source services ecosystem comprises vendors, such as Red Hat (US), Accenture (Ireland), Wipro (India), IBM (US), Infosys (India), Cisco Systems (US), Atos (France), HCL (India), HPE (US), Oracle (US). The global open source services market is expected to grow from USD 11.40 Billion in 2017 to USD 32.95 Billion by 2022, at a Compound Annual Growth Rate (CAGR) of 23.65% during the forecast period (2017–2022). The major growth drivers of the market include the accessibility to the source code which enables enterprises to study and modify the software as per the requirements. Open source adoption in organizations is expected to grow across all the IT segments to avail the flexibility and effectiveness in performing tasks with benefits, such as reduced costs, accelerated time-to-market, and simplified interoperability. Open source services are the service offerings which focus on open source technologies across the entire technology spectrum – from servers to data integration software (cloud management, orchestration, DevOps, etc.) to critical business solutions, such as customer relationship management and big data. While the core offerings are similar to traditional IT service offerings (consulting, implementation, support, etc. ), open source services are tailored around the open source software. Open source services help enterprises to drive internal IT innovation, operational effectiveness, and business value creation. When a company uses open source products, it becomes partly dependent on the open source community for documentation, technical support, and further software upgrades. The open source services market faces a major security challenge in open source software solutions. The open source services market research report outlines the key trends, and market sizing and forecasting for various subsegments of the market. The report also provides detailed information on key global adoption trends, future growth potential submarkets, key drivers, competitive outlook, restraints, and opportunities of the market ecosystem. It also offers insights into the current and future revenues of market from 2017 to 2022 and is aimed to provide the reader with an understanding of market drivers, current and upcoming players, and the competitive landscape. The global open source services market has been segmented by 4 major geographic regions: North America, Europe, Middle East, and Africa (EMEA), Asia Pacific (APAC), and Latin America to provide region-specific analyses in the report. North America is estimated to hold the largest market share in 2017 and is projected to continue to dominate the market during the forecast period. The adoption of open source services is increasing in APAC and EMEA, due to the rising IT spending and increasing digitalization. A majority of the enterprises are adopting open source technologies to gain the competitive advantage, flexibility, shorter development time, and to ensure the successful implementation of their roadmaps. The governments across the globe are encouraging the adoption of open source services for the public sector to provide an open platform for the vendor and buyer meets. Major vendors of open source services across the globe are Red Hat (US), Accenture (Ireland), Wipro (India), IBM (US), Infosys (India), Cisco Systems (US), Atos (France), HCL (India), HPE (US), and Oracle (US). 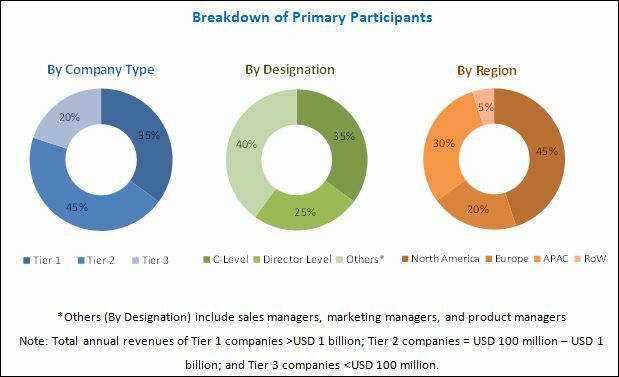 These vendors have adopted various organic and inorganic growth strategies, such as new product launches, partnerships and collaborations, and mergers and acquisitions, to further strengthen their position in the open source services market.